The Canadian graphite scene is undergoing an exploration boom at the moment, and it’s down to one reason: bigger brother the US has become almost paranoid about securing supply. 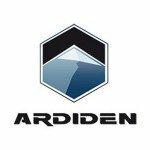 At the moment, micro-cap stock Ardiden Ltd (ASX:ADV) represents one of the few opportunities in Australia for punters to buy into the North American graphite story. ADV is drilling its Canadian graphite play right now, testing key electromagnetic targets with the drillbit. This drilling is fully funded by a recent successful Share Purchase Plan, which raised $1M for the company. So far ADV has had some pretty promising results, and has managed to improve the end-game economics of potential future production, even at this very early stage. At 1c and a market cap of $6.7 million (at the time of writing), this is a penny play which could either flounder around, scratching for capital, or it could become a ten-bagger. Make no mistake, this is a very early stage play and carries all the risks associated with that. Success in ADV uncovering commercial quantities of graphite is no guarantee here, and this is a speculative stock. While assays from initial drilling are yet to come back, ADV’s drilling has been as good as one could reasonably expect. Assays are due back any day now, and that combined with more drilling at its flagship project could signal the start of a compelling graphite journey. Trying to pronounce the name of ADV’s project may be akin to nailing jelly to a wall, but what you need to know is that this ADV project is looking highly prospective at this stage, and is being actively prodded with a drill bit. ADV has a couple of other projects on its plate, but Manitouwadge is the main game at this stage. The Company picked up an option to acquire 100% of the project in October last year. The project itself is located roughly 100km away from Lake Superior in Ontario, Canada. 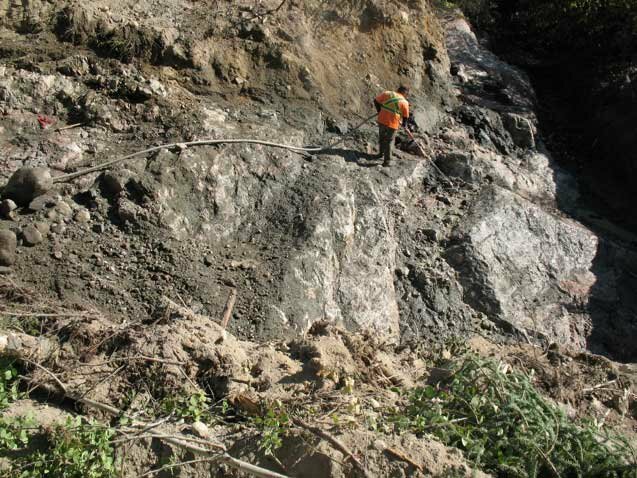 It measures 3400 hectares and historic metallurgical tests on the ground indicated that 55% of the prospect’s graphite was either large or jumbo in size. Previous diamond drilling had firmed up the prospectivity of the project, and a review of geotechnical data done before it recently started spinning the drillbit found that there’s an electromagnetic anomaly on the project measuring a whopping 19.3km of strike length. Anomalies on EM surveys usually indicate mineralisation under the surface, so finding a 19.3km long anomaly means it’s definitely worth following up with drilling – which it is currently doing . The below map gives you some idea of the locations of the conductive trends that ADV is going after. 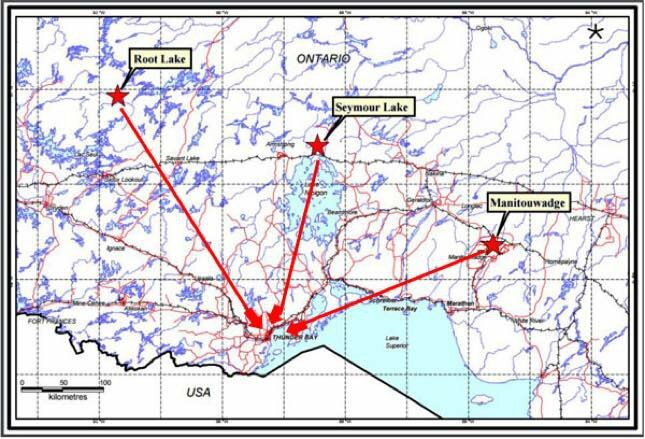 The tenements in red are the tenements it picked up fairly recently, and the Silver Birch, Thomas Lake West, and Silver Star tenements are at the centre of promising outcrop sampling and flotation testing. Metallurgical testing of graphite sourced from ADV’s tenements confirmed that the jumbo flake at least is suitable for low cost flotation and gravity beneficiation with sample grades of 95.6% returned. Sampling also brought back grades of up to 13.6%, but neither the outcrop drilling nor the metallurgical testing are enough to call ADV’s project hot or not... yet. What’s known is that ADV is in a desirable street address with its project. The project is just 100km from Zenyatta Ventures Ltd’s Albany deposit, and while we don’t profess to be intimately familiar with all Canadian graphite players, we can tell you that Zenyatta is creating waves right now . Looking at its figures and progress, Zenyatta Ventures could be one of the most promising explorers north of the border. Better yet, the 13.6% graphite grade referred to earlier puts ADV within the Zenyatta ball park. Remember that ADV has a market cap of $6.6 million, so it has some catching up to do. And ADV is trying to do just that with its current round of drilling. The latest drilling is focusing on the Silver Birch West and East tenements, and the Silver Star tenement. ADV started drilling in November, targeting anomalies brought up on previous surveys. 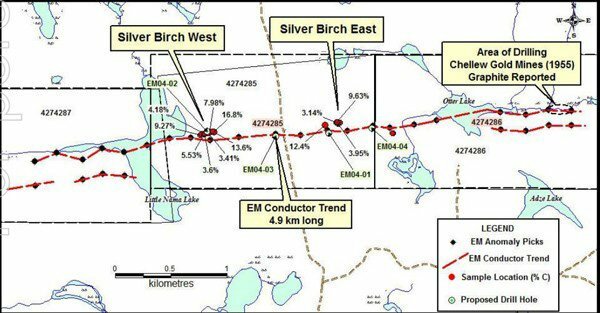 The company also took grab samples at both tenements, with grab samples at Silver Birch coming back with grades of up to 16.8%, while grades at Silver Star came back at 11.8%. While those grades are world-beating, they were grab samples only and don’t necessarily reflect the graphite at depth. Luckily ADV is just starting to drill now to get more idea on graphite at depth. The above is a sample of the grab samples ADV took at Silver Birch. Drilling is in the early stages, but it last reported 14 of 15 holes drilled at both Thomas Lake and Silver Star which hit graphite mineralisation . However, assays need to go back to the lab to see what kind of graphite ADV has on its hands. ADV has also followed up with additional drilling and has promised to update the market by early December – which is right about now... so there’s potential for imminent share price movement here. But there is also potential that the drilling does not uncover anything particularly compelling and the share price does nothing. When investing in stocks like ADV, please do your own research and consider your own personal circumstances before investing all your hard earned. However, it was perhaps the metallurgical testing which had the biggest impact on the potential of ADV’s project so far. Initial test metallurgical work had identified that raw graphite from Manitouwadge could be brought up to 94.8% for jumbo flake, and 94% for large flake. Well, thanks to further testing it’s managed to bring that processing cost up to a whopping 96.8% for both flake sizes. An improvement of 2% doesn’t seem like a reason to jump up and down for joy, but in the graphite game every little bit of grade matters. By increasing the grade by 2%, it opens up two possibilities. Number one, it can sell the product as is and at 96.8% there would be more than a few buyers. Two, it can also use a caustic bake method to bring it up to more than 99.95%, which is essentially the finished article. Using a caustic bake method, while relatively low-cost, can cost a heck of a lot of money and is energy intensive. The lower grade ore put in, the more it costs to get it to that saleable grade. So a 2% improvement is essentially a 2% improvement in end costs. When we’re talking about millions of tonnes of throughput, 2% adds up to a fair few bikkies. This, of course doesn’t account for any further improvements in the flow sheet ADV may be able to come up between now and production. Even if it doesn’t end up producing itself, it gives a potential buyer confidence that graphite at the project can be processed up to snuff at relatively low cost. We should mention at this point that production could be years away – if at all – it’s very early days for ADV. Its recommended investors seek professional advice before in small speculative stocks like ADV. So it turns out that we here at The Next Small Cap and sister site The Next Mining Boom write about graphite. We’d be sick of it if it weren’t one of the most promising market opportunities to come to the mining space in recent years, and one of the commodities expected to play a leading role in revolutionising the world. For starters, it’s one of the key ingredients in lithium-ion batteries, which in themselves are set to evolve the way we use energy. Those batteries are the things that are literally powering Tesla’s rise up the automotive food chain, and as they get better and better, its batteries will take a longer charge and be able to expend more energy before running out. The Tesla Gigafactory is having a big influence on the US graphite scene. One of the major factors inhibiting the uptake of electric powered cars is the fear of running out of electricity in the middle of nowhere. However, should electric batteries get to the point where electric cars have a longer range than petrol cars, we could see something very exciting happening as petrol-powered cars are phased out for electric ones. They’re also used in Tesla’s new ‘Powerwall’, which is a giant battery which can be installed on someone’s house to capture solar energy for use later. No more fears of a rainy day here, if everything works out to plan. 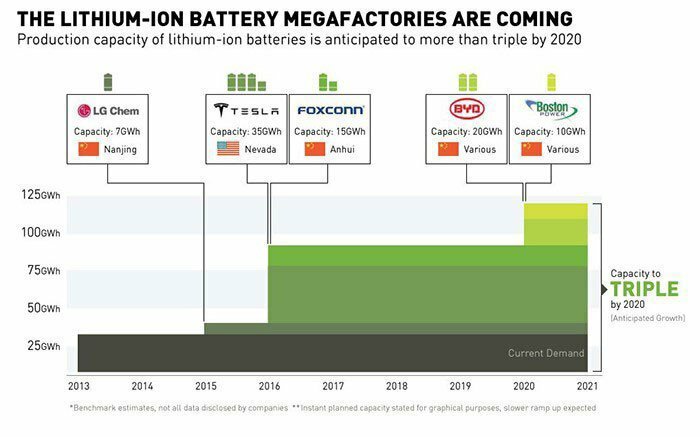 This chart shows you just how much demand is set to skyrocket over the next few years, as lithium ion battery production starts to add to graphite demand. But of course, lithium ion batteries are just one part of the equation for graphite (and subsequently graphene). 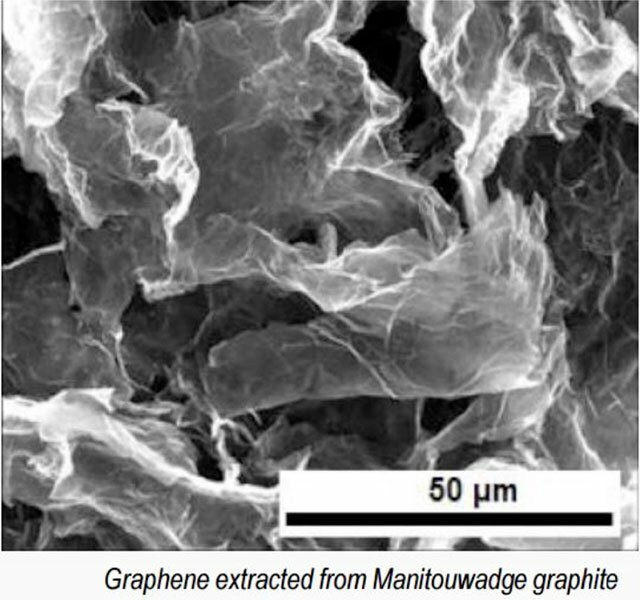 New uses for graphene are being found all the time. In fact, here’s a chart from the UK Intellectual Property Office showing just how many patents have been filed for graphite and graphene-related ideas. There’s no coincidence that it’s being touted as a ‘wonder material’ by some observers. Guess who has the most production, the most demand, and the biggest stockpile of graphite – potentially the most strategic resource in the world? Guess who has the most production, the most demand, and the biggest stockpile of rare earths in the world? Guess who is upset by both of those statements? To tell you how the graphite story may play out, we first have to tell you about how the rare earths story has played out. China, with its lower costs and lax environmental standards, has spent the last 20 years basically usurping the US in the rare earths market – clearly identifying them as a resource in basically everything. China expanded production to the point where it’s estimated that it controls roughly 95% of the entire market. In 2010, the US got a taste of what sort of the power Beijing’s dominant market position could wield. It all began with a fishing boat. Back in September of that year, a Chinese ship strayed into Japanese contested waters – and of course China claims these waters as well. While the Chinese vessel was told to turn around by the Japanese coast guard, it did no such thing. In fact, allegedly, it rammed the coastguard vessels. The Japanese coastguard then boarded the boat and arrested the captain. It’s then when China flexed its muscle . It decided to cut off production to Japan (or rather just loaded boats very, very slowly) in protest of the arrest, with the cut off of supply prompting a World Trade Organisation dispute. It was a sign that China would use its market power to throw around its weight, and the US did not care for it one bit. So why is the rare earths story so important for ADV and the US? Because the same story could very well play out with graphite. 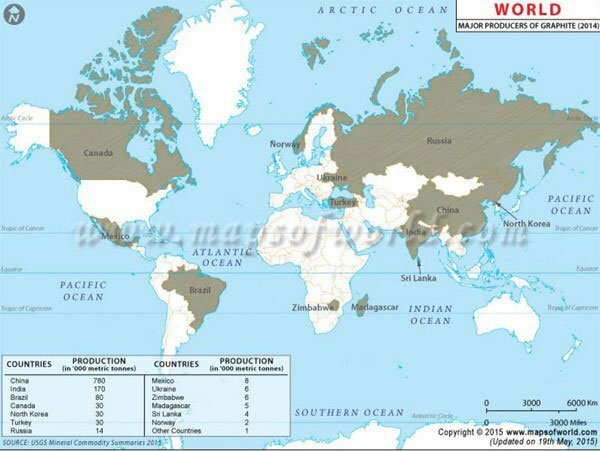 At the moment, it’s estimated that China controls roughly 70% of the world’s graphite production. As you can see from the above chart, China has a dominant market position in the graphite game. China is also buying up graphite from emerging producers, as in evidence from Triton Minerals’ (ASX:TON) $2 billion offtake deal done with a Chinese company earlier this year . With China buying up supply for domestic purposes and Indian supply not likely to make its way to US shores that does leave Brazilian supply in the market, but the US is going to need a lot, lot more. Enter the likes of plucky explorer ADV. The US government would prefer that vital minerals are sourced from friends, and as close to home as possible. In fact, companies such as Tesla have copped flak for sourcing materials they need from outside US borders. But it won’t always be possible to source from the US. ADV is an early-stage company and quite away from thinking about supply deals and macroeconomics. However, the likely US demand that it source graphite from friendly nations has ADV in pole position once those talks do start. ADV is an early-stage company, and both its share price and market cap reflect this. But, for an early-stage company, ADV is doing pretty much everything right. It’s bought into prospective acreage, conducted geotechnical studies to narrow the focus to the key sweet spots, and now the company is drilling. With assay results due back soon, this could very well be something for ADV shareholders to be on the lookout for. In the background, ADV has worked diligently to firm up the economics of processing to the point where it now has multiple options for commercialisation. It is also playing in a market where things are expected to become very, very good for Canadian producers. With the US keen to move away from China dependency, and also keen to spur its own high-tech manufacturing boom – it appears the market fundamentals are about to shine on ADV.